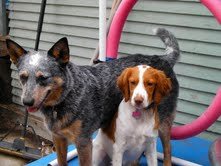 I have owned and operated a dog day care and training facility for over 18 years now. I have a lot of experience in this arena, have learned a ton (thank goodness) in the past 18 years and my opinions and recommendations on dog day care have changed. When I opened in 2000, dog day care facilities were a brand-new thing. I used to recommend day care for most of my training clients (and other folks too) and now, more often than not, I ask people to decrease the number of days their dog goes to day care or tell them to stop attending day care completely. Spouting from my own mouth back then was “a tired dog is a well-behaved dog.” We’ve all heard it and well yes, exercise is a necessity and dogs definitely need it but I think some of us have taken that a bit too far. Sometimes a “tired/well-behaved dog” is actually a super-stressed-out-mentally-and-physically-exhausted dog. 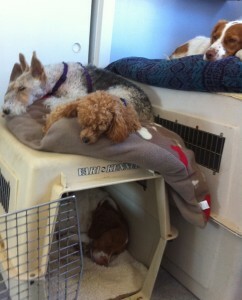 For the dogs that day care is good for, it is really good, great in fact. But for dogs that day care is not good for, it can be extremely detrimental and damaging to that dog’s behavioral health. How can you know when dog day care is bad for your dog…? Your dog is not a good day care candidate. Day care is not for every dog. I think day care is really good for only about 20% of the dog population and OK for another 30% or so. That leaves about 50% of the population I do not think do well in day care at all and whose behavioral health is at risk. Keep reading to determine if that’s your dog. The physical space does not work for your dog. If your dog is shy, anxious or nervous, day care may not be the right option for him. The physical set-up for a dog like this matters greatly. Some dogs do OK in a big space with a lot of dogs but the majority do not. Most dogs will do best with a smaller group of dogs. I do not like to see more than 15 dogs (even that can be too much for a lot of dogs) in a space. I recommend staying away from any center that has more than 20 dogs together in one space. In cities, it may be hard to find a day care facility with an outdoor potty area but I would look for that as well. Some dogs who may not like a big room with a bunch of dogs may be perfectly comfortable and happy in a small space where they can hang with a few (maybe mellow) dogs and humans. And, some dogs really just don’t want to hang out with other dogs at all and that’s OK! I’m not a fan of big parties/clubs but let me hang with a few of my besties in a quiet space (even better if we can eat and drink too) and I’m in! Your dog goes to day care too often. Please, do not send your dog to day care 5 days/week. That’s way too much activity, both mental & physical and much too stressful. In our facility, we do not allow it. If you work long hours make other arrangements. Try day care 2-3 days per week (max) and a dog walker or other alternatives on the other days. If you work long hours and are thinking of getting a puppy – don’t! Adopt an adult dog who will not need the same time commitment and can handle some time alone. The exception to everyday day care would be for a puppy 8-16 weeks who attends a specialized “puppy camp.” These are specialized programs geared for very young puppies where pups go for part of the day every day or are crated for frequent naps, introduced in very small groups (3-6 pups) and are monitored carefully. These are not cheap so if you want a puppy, plan for it. Your dog does not need to go to day care every day and should be able to cope with some time alone. Be sure to have some stretches of time where you dog is home alone so that he can learn to be OK with that too. I do not like to see a dog in a crate for more than 4 hours at a stretch though, so figure it out. If your dog must go to day care for several days ask the day care to crate/kennel/separate your dog for breaks and naps during the day. Your dog should not be running around for 8-10 hours straight. A dog day care facility should have a separate space (kennels or crates) for dogs to relax. Some dogs are good at taking a break on their own but many (most) adolescent dogs need to be separated and crated or kenneled from the activity in order to rest. A facility that claims to be completely “kennel-free” and “crate-free” is not what you want. Your day care dog is not getting socialized sufficiently and is missing out on other, very important stuff. Besides creating an over stimulated, overtired dog, when I see a dog going to day care too often (every day), I see a dog NOT going on regular walks or doing other activities (hiking in different areas, training, etc.). The dog comes home too tired to go for a walk (much less a fun training session) and “doesn’t need it.” The human is fine with that because she has been working all day. We know now (I didn’t 18 years ago) that a dog’s walk is just as much, maybe more so, about his nose (smelling and investigating new things!) than it is about his legs and lungs. Your dog needs to go out for a walk to “exercise” his nose every day and a “well socialized” dog does, and is comfortable doing, a variety of activities. Your day care provider is not talking to you. An open dialog with the day care staff is crucial. The staff should be making continuous behavioral assessments of your dog in the environment. A dog may start out great at day care as a young dog but his feelings and tolerances may change as he gets older. Ask how your dog is doing. When the staff talks to you about your dog’s behavior at day care, this is not a personal reflection of you or your dog “parenting” skills. You need to know how your dog is doing at day care. A day care provider should not want your dog to attend if your dog is stressed out and not thriving in this environment. Your day care staff is not trained. Dog day care has now become big business. Unfortunately, the staff at a dog day care may know little to nothing about dog behavior. Day care staff should have extensive training on reading canine body language. They also should not be using aversive techniques like walking around squirting dogs with spray bottles, shaking coin-filled cans or making loud noises to “manage” the environment. You are your dog’s advocate and protector. Learn what is best for your individual dog and make your choices based on what is best for your dog even if that is not what may be best/easiest/pleasurable to you.